Having plants in your home clears toxins in the air, adds a pop of green to your decor, and makes your home feel inviting overall. But trying to start your own indoor jungle is no easy feat. 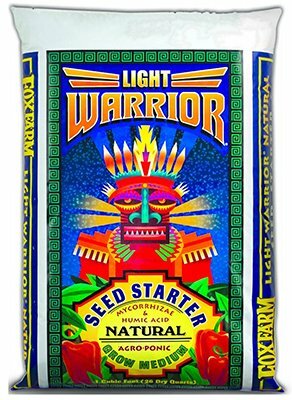 Let the FoxFarm Light Warrior Soilless Seed Starter Mix give you a hand in getting your plants started. Composed with an organic blend of a powerful root stimulator, mycorrhizal fungi, sphagnum peat moss, horticultural perlite, earthworm castings, and humic acid, this mix is a perfect start for starting or transplanting plants both indoors and outdoors. This fast-draining formula should be moistened and drained before planting your new seeds as indoor seeds should not sit in water. Start your new plants off with the FoxFarm Light Warrior Soilless Seed Starter Mix and watch your home fill up with beautiful, thriving greenery!